formerly 5 Westminster Mews, London, U.K.
Powers/Abilities: An exceptional intelligence officer, John Steed was skilled in all aspects of spycraft. Despite his carefully crafted and maintained appearance as an urbane city gentleman, he was a more than capable brawler and skilled in a variety of weapons, especially swords. Though an expert shot, he rarely used a gun, preferring to rely on his reinforced umbrella and steel-lined bowler hat. (The Avengers TV series) - Expelled from the prestigious Eton school, John Steed joined the British army and rose to the rank of Major before transferring his skills to an unidentified branch of British intelligence, where he worked alongside a variety of partners, most notably Emma Peel, taking on esoteric threats and diabolical masterminds who threatened Britain, and often the world itself. While maintaining a generally jovial, always gentlemanly appearance, he was also ruthless and cunning, and never to be underestimated. (Doctor Who Magazine#173) - Steed and Peel visited Bonjaxx's bar on the spaceport of Maruthea, located at the dead center of the space-time vortex, a popular destination for time-travelers and reality-hoppers, and attended the owner's birthday party. 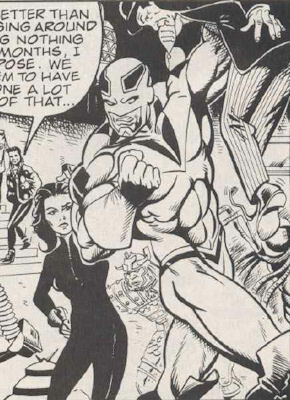 When a barroom brawl broke-out, Steed found himself hoisted into the air by a member of the Corps (probably a Captain Britain variant, based on the costume), but before he could be punched, Mrs. Peel intervened, tapping Steed's assailant on the shoulder. 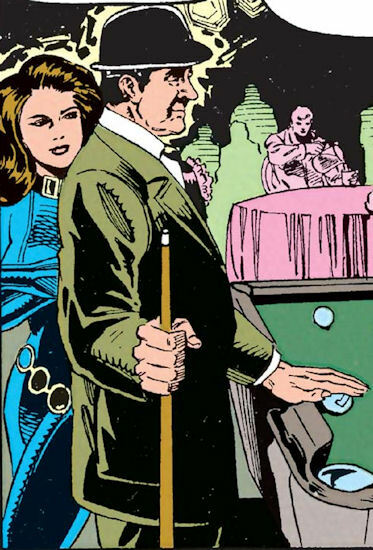 (Captain America I#401) - On Earth-616, Steed and Peel visited the Laughing Horse Bar on the Lower West Side of Manhattan, where Steed played pool (or snooker) against a Humphrey Bogart-lookalike (see comments). Comments: Created by Sydney Newham, who would later be the initial creative force behind Doctor Who, with Brian Clemens (initial script). Introduced to Marvel by Gary Russell, Mike Collins and Steve Pini. Introduced to Earth-616 by Mark Gruenwald, Rik Levins and Danny Bulandi. John Steed made his debut in the first episode of British TV show The Avengers in January 1961, more than two and a half years before Marvel's Avengers came together. Played by Patrick Macnee for the entire six season run of the show, plus two seasons of the New Avengers revival in the 1970s, he became recognizable around the world thanks to Macnee's suave manner and distinctively British appearance. The first season, where Steed is teamed up with Dr. David Keel, are far more noir than the borderline science-fiction spy adventures of the later seasons, and initially Steed wore a trenchcoat, but before the end of the show's first year he'd switched into the suit and bowler hat that became his trademarks. Steed made the leap into comics early, with a tale in the one-shot TV Crimebusters, an anthology released in the format of a British annual in 1962 where he appeared alongside his then-TV partner Dr. David Keel, and alongside strips for other shows such as Danger Man, 77 Sunset Strip, Charlie Chan and Dixon of Dock Green. In December 1963 an Avengers newspaper strip began in a handful of publications, running for a total of four stories and ending in September 1964. The series got another, more enduring strip starting in TV Comic#720, cover dated October 2nd 1965; as the comic's title might suggest, TV Comic featured strips based mainly on cartoons and television shows, and The Avengers shared that first issue with the likes of Popeye, Doctor Who and Beetle Bailey. When Gold Key decided to test the waters of the American market, they reprinted some of TV Comics' Avengers strips in what proved to a be one-shot; because Marvel held the American comic trademark to the Avengers' name, Gold Key called their title John Steed Emma Peel. 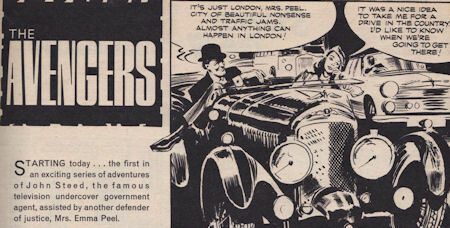 Marvel creators were well aware of the British show, and the name coincidence, as evidenced by dialogue in Avengers I#83, when Jeanie Thomas is introduced to the Avengers and asks which one of them is Mrs. Peel. Later, in Defenders I#51, Moon Knight compares his teaming up with Nighthawk as a "regular John Steed and Emma Peel combo." Nighthawk, for his part, wanted to know which of them was Peel. While in both cases these are clearly nods to the TV show, the framing of the comments allows for them both to be referring to real people, though it's perhaps worth noting that Steed and his partners were never, to my knowledge, ever actually called "the Avengers" within the show. Then, famously, the show influenced Chris Claremont and John Byrne's X-Men run; the idea for the enduring X-Men foes the Hellfire Club came from The Avengers' "A Touch of Brimstone" which aired on 8th February 1966, a story considered so risque at the time that the U.S. banned it! In that story, Steed and Peel took on the Hellfire Club, and while most comics fans know that Peel's "Queen of Sin" outfit is undeniably the inspiration for the Black Queen's costume in the X-Men, it's perhaps less well known that that Peel was brainwashed just like Jean Grey into joining the Club, and that Marvel's Inner Circle are all decked out like the Avengers' TV series' Hellfire Club - just take a look at a shot of them from the show. 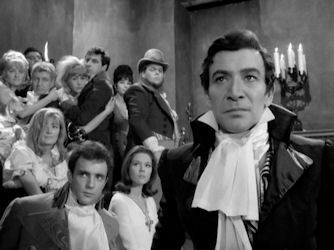 In case you're wondering, that's Peter Wyngarde, the surnamesake and visual inspiration for Jason Wyngarde, Mastermind, standing on the right of the picture; when he grew a beard and moustache, as he did later for his own TV series, Jason King, the likeness is striking. So it was probably inevitable that Steed and his most famous partner, Emma Peel, would turn up in Marvel Comics sooner or later, and more surprising that there's only been two tiny cameos that I could find. Maybe they've just been too busy elsewhere in the Omniverse - Steed and Peel have been busier over at DC where they showed up in Superman II#13 pursuing the Toyman, attended an agent's funeral in DC's adaptation of another British series, The Prisoner, mixed with a bar full of superheroes in Kingdom Come#2, and ran into the 1966 Batman. Steed and Peel also turn up in Simpsons Comics#87, which I mention mainly because they do so in the company of the fourth Doctor. At the end of Bonjaxx's party in Doctor Who Magazine the fourth Doctor arrives at the bar; we know he has form for dropping people off in 616, so maybe that's how Steed and Peel got there to appear in Captain America I#401, traveling from Maruthea via Springfield to Earth-616? As always with profiles for characters brought into the Marvel universe, for the most part I'm only acknowledging allies, enemies and adventures explicitly shown to count for the 616 version, with an overview of the other tales featuring the character to provide a general understanding of their life. These other tales might also be true for the 616 version, but we can't know for sure. Notably, I've left off all of Steed's other partners - David Keel, Venus Smith, Cathy Gale, Tara King, Mike Gambit and Purdey. 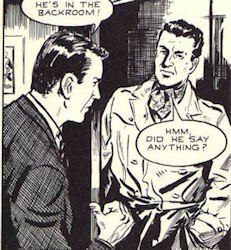 There is a John Steed-lookalike character on Earth-616, Powell McTeague. Introduced in Avengers 1959#1, he not only looks like Steed (because he's visually based on him), he even uses a variation of Steed's catchphrase "Mrs. Peel, we're needed," when he first appears. Though his debut sets him in 1959, it is still conceivable that Powell is the man we see in the Laughing Horse Bar, but I prefer to think not, if only because of the presence of Peel - though his companion might feasibly be Emma Steed, Black Queen of the London Hellfire Club. Speaking of that bar, Steed's fellow player might be Sam Spade (given how many other literary, TV and movie cameos are present) or maybe Clive Reston's pal Richard. His attacker in Bonjaxx's bar is definitely a member of the Corps, and could even be 616's Captain Britain, but it's impossible to say for sure.